So, as we’ve been based near the centrally located Waikato town of Putaruru for the last few weeks, we have taken the opportunity to visit some of the small towns that service the farming communities that make up the Waikato. I’m not going to talk about the capital of the area, the city of Hamilton, as I want to share the charm of the small towns. They each have their own special character and history, have found something to celebrate their town and made it their own, and while doing so, attracting business to their spot on the map while still fulfilling their primary purpose of servicing the surrounding farming families. Many of us have driven through, or stopped in Tirau. Charming cafes, interesting shops to browse which include fashion and homes wares, interior design, crafts and more, but it’s the super-sized corrugated iron buildings shaped like animals that grab our attention. There are three, a dog, a ram, and a sheep, the creation of original owners, John and Nancy Drake, who started with the sheep back in 1994 to boost sales of their wool products business. The dog followed in 1998. It houses the Information Centre and public toilets, and in 2005, the ram completed the trio. They are unique, and I’m sure many of you know them already, but hats off to their creators. They are now iconic Tirau. At this time of the year, the cherry blossoms are flowering all over the Waikato, and Cambridge, a charming village at any time, looks particularly stunning. See also the header photo. We have had lunch at the Deli on the Corner several times, and it’s always delicious. We’d never been to Te Koutu Park before, but discovered it last week, attracted by the blossoming cherry trees as we drove past the entrance road. There’s a lake there and this stunning cluster of cherry blossoms. Being so close to the city of Hamilton real estate prices hold their own in Cambridge. It has an English village charm, and even a village green, and has always been popular with commuters who don’t want to live in the city, young families, and retirees, and I don’t think that’s going to change any time soon. It’s also home to the Avantidrome cycling velodrome, close to Lake Karapiro for rowing facilities, and famous for a number of thoroughbred stud stables. At the base of Mt Te Aroha (which is the highest point of the Kaimai Range) is the small town of Te Aroha. It’s 53 kms northeast of Hamilton and 50 kms south of Thames at the bottom of the Coromandel Peninsula, and 21 kms from Paeroa at the start of the Karangahake Gorge, which takes you through to Waihi. I vaguely remember it from my early childhood as my parents lived in Paeroa for a few years before and after Dad’s war service. The Mokena Geyser, the only natural soda water geyser in the world, does it’s thing about every 40 mins, (not while we were there though unfortunately), in the Edwardian Domain in the centre of town. The Domain is worth a look around. It’s said to be the only intact Edwardian domain in NZ. The mineral waters here have been renowned since the 1880s for their healing properties and are still a popular attraction. These days traditional massage and beauty treatments are also offered at Te Aroha Mineral Spas, housed in one of several old Edwardian style buildings in the Domain. I found this old poster from the early days on the bathroom wall in the Cottage Cafe, and I love the detail it describes. From how to get there by train, comparisons to European spas, to diseases that may be helped by the 18 different springs available. The Sanatorium of New Zealand must have given Rotorua a run for it’s money back in the day. The charm of this place is it’s Edwardian history, and it’s a great little place worth spending time in. An interesting story is told on one of the information boards about how this powerhouse was camouflaged during WWII to prevent it being targeted during possible Japanese air strikes. This was done by placing masses of foliage on top of the powerhouse, and painting the building in camouflage colours, concrete cones being positioned over the generators. Smoke generators were also used near the Arapuni Hall in the early 1940s to create a smoke screen. The Japanese never arrived and the powerhouse and dam survived the war unscathed. It has since been awarded a Category 1 listing with the Historic Places Trust. If you drive into the sports grounds on Arapuni Rd and park behind the bowling clubrooms, the cycle trail and walk down to the bridge is right here. We had coffee at Rhubarb Cafe just along the road from here, in Arapuni village, where several groups of cyclists came in for a break, along with motor cyclists and other weekend drivers like us. 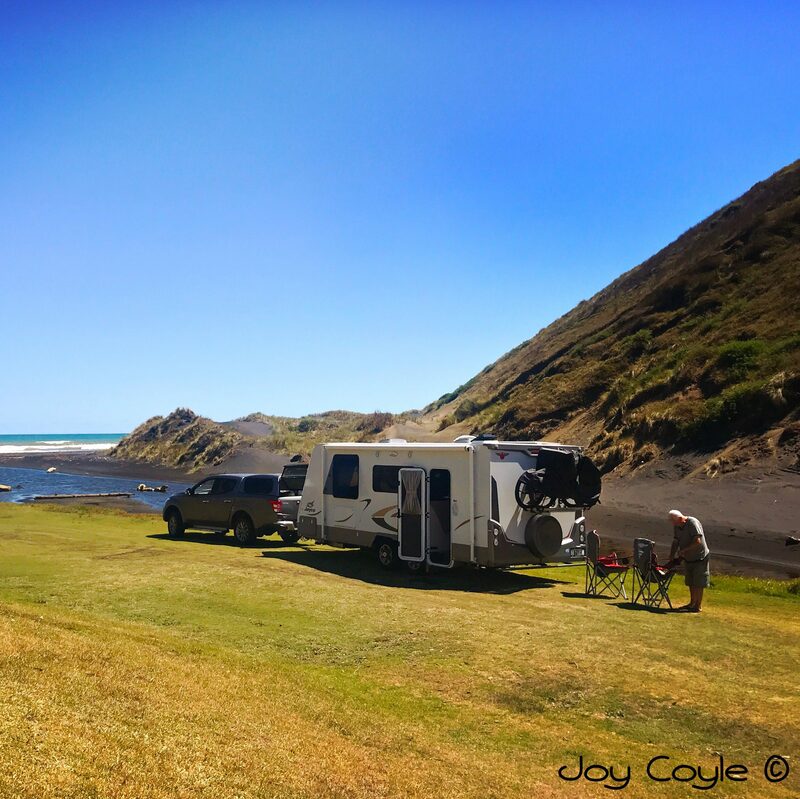 and then to Jones Landing, a freedom camping spot near Arapuni (#1758), a pretty place by the lake. Self contained caravans and motorhomes can stay here for 2 nights without a permit. Longer than two nights requires you to get a permit from the South Waikato District Council or the districts Information Centres. 3,400 hectares, Sanctuary Mountain is the largest pest-proof fenced project in the world, providing a safe environment to reintroduce some of NZ’s most endangered species back into their natural habitat. It’s been administered by the Maungatautari Ecological Island Trust since it’s formation in 2001. Read more about it here. They do guided tours. part of the charm offensive of the Waikato I reckon.